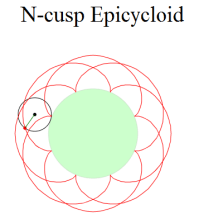 SVG Animation Example: Nested Apollonian Gasket [n,n+1,n(n+1),n(n+1)+1] (n=2,10) – Soddy (three tangential Circles) and Descartes’ theorem. 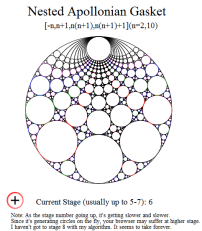 It may be slow because it’s calculating circles on the fly and my circle packing algorithm is not efficient. 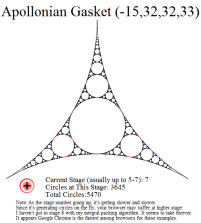 SVG Animation Example: Apollonian Gasket (-15,32,32,33)-Core section: Soddy (three tangential Circles) and Descartes’ theorem. 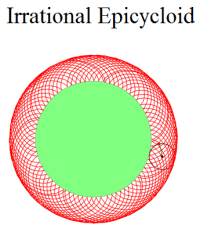 It may be slow because it’s calculating circles on the fly. 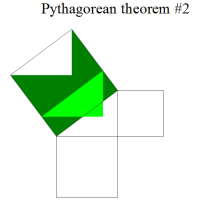 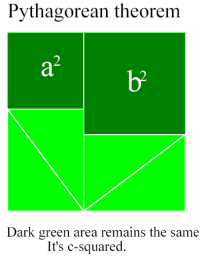 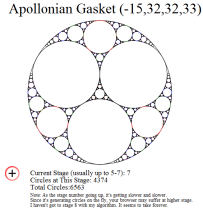 SVG Animation Example: Apollonian Gasket (-15,32,32,33)- Soddy (three tangential Circles) and Descartes’ theorem. 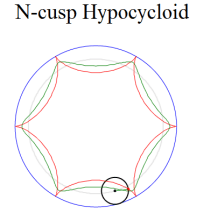 It may be slow because it’s calculating circles on the fly.